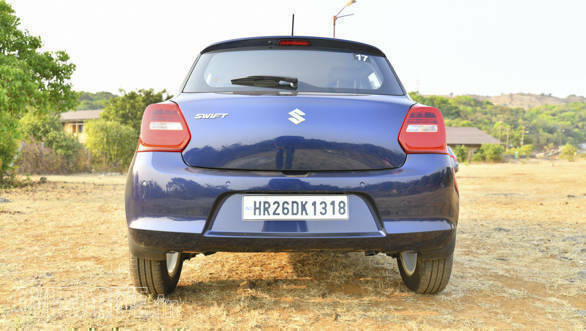 It's almost like Maruti Suzuki can do no wrong, when it comes to the Swift  all generations have always been best-sellers! This much was apparent when we first drove the car at the start of this year, before its launch at the 2018 Auto Expo. When we drove three generations of the Swift back-to-back, the notion of the nameplate having all the right ingredients was furthered. After having driven one in all flavours -- both diesel and petrol, manual and AMT, I thought the diesel was the better city and highway car. And, after testing the diesel AMT, we think there's more than meets the eye. With as many Swifts on the road as there are, you'd think it'd be easy to gloss over one, right? But there's something about its stance that makes me look twice at it, especially in the metallic silver, which you don't see too often. It's a simple, confident design but the subtly flared haunches help immensely. 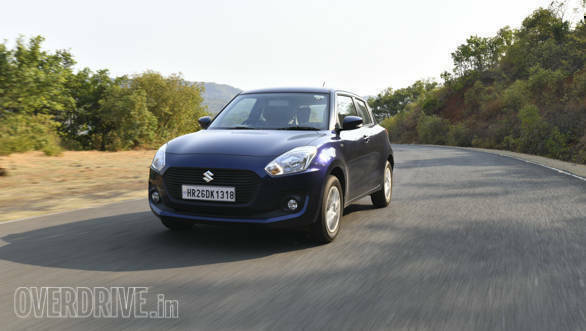 Unfortunately, at launch, Maruti Suzuki only offered the AMT on the second from top model (the ZDi in this case). And the top '+' model is the one with the superb looking projector headlights and LED DRLs, which really make the Swift stand out. Luckily, the rear still gets LED combination lights. So what you're left with is still a good looker, but not as special as it could be. The hidden door handles, which do wonders for the looks, have to be pointed out to first-time Swift passengers. It's surprising that a mass-market car like the Swift gets a flat-bottomed steering wheel, but boy am I glad it does. It feels great to hold, and inspires memories of Fast and Furious every time you take a U-turn, or go lock-to-lock. It's a proper JDM-cabin in here too with straight lines, seats with high bolsters, subdued colours, pods everywhere and emphasised dials  I never tire of the classic red on black combo. And JDM of course means that utility isn't sacrificed, with plenty of storage space around the cabin and the passenger side seat back pocket. Unfortunately, the quality of materials used is nothing spectacular for the segment, and the sun visor falls woefully short of keeping the sun out of your eyes when driving parallel to it. There's good support for the front seats, though the rear passengers do get a little short changed in terms of leg room. The dark cabin and rising window line also means the impression of space suffers, but that's the price you pay for sportiness. 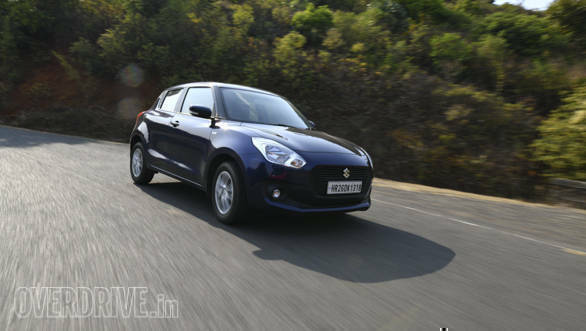 The 1.3-litre DDiS 190 with 74PS and 190Nm torque is familiar, and a little noisy. But it's also strapped into a new body and chassis (the fifth-gen Heartect platform) which is substantially lighter than the previous generation. It's a little hard to pin point the exact figure on this AMT variant, because it has no outgoing counterpart but it's at least 60kg lighter. 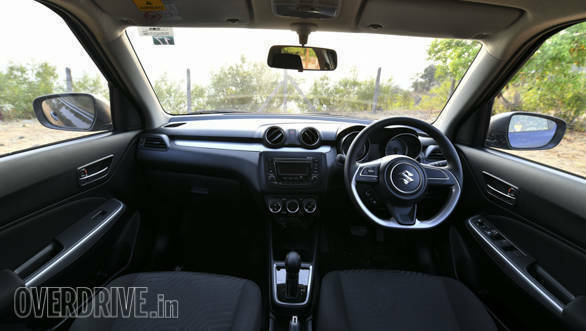 The five-speed Magneti Marelli sourced AMT is familiar too, but has seen a little more development than what we're used to in some of the earlier Maruti AMTs. Still, if you've let the sporty looks and sporty cabin get to your head, nailing the throttle at every opportunity will be met with slightly delayed downshifts and head nod on upshifts. That usually brings me back down to earth, at least. But we managed a best of 12.1s in the 0-100kmph run, which is more than respectable for a diesel hatch, an AMT at that. Most diesel AMTs have a hard time in traffic, because of turbo lag and the AMTs affinity to early upshifts. The Swift is slightly better, but can take you by surprise sometimes by lurching forward instead of creeping forward. It does like its higher gears though, and in traffic you're likely to be in third or fourth with just about enough to amble on. Overtakes need downshifts. Even with slower downshifts, the massive torque results in roll-on figures that are almost on-par with sporty cars (with a more advanced automatic box) like the Polo GT TSI! That's certainly not how it feels  and a good reminder of how tractable diesels are! Of course, the high point of a diesel hatchback is the fuel efficiency. We got 17.1kmpl in the city, and 22.6kmpl out on the highway. 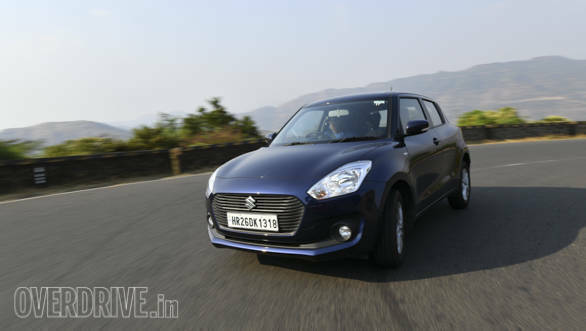 For a sporty hatch, the Swift rides quite well. But wait, it's a diesel automatic, more likely to be ferrying a family around. Well, in that case, it never truly isolates you or the passengers from what's happening under the wheels. But it's not jarring either. The highlight of the Swift is its light and agile nature, and it's been amplified with its almost too-quick-to-react electric steering. It is electric around corners, with a lot of grip and very little body roll, though feedback from the wheel is muffled. It's a fun-to-drive hatch, but you can tell it puts city driving first. Out on the highway the steering almost always feels too light, and too vague. If you get used to the constant corrections it wants, its fine but that's not what YOU want, is it? There's good stopping force at the pedal, and for such a small, light car, it keeps its composure under heavy braking.